Michael O'Connor finished with a brace to help Linfield beat Newry City AFC at The Showgrounds. Pic by Pacemaker. Michael O’Connor’s double at The Showgrounds moved Linfield six clear at the top of the table as David Healy’s side got the better of Newry City AFC. The young striker notched early in each half, with City missing a chance to draw level with Dale Montgomery seeing his spot-kick saved early in the second period. The Danske Bank Premiership league leaders began very much on the front foot, with the sticky pitch proving little problem as they kept the ball almost exclusively in the opening few minutes. After Dara Noonan was booked for a late challenge on Linfield captain Jamie Mulgrew 30 yards out as early as the fifth minute, the in-form Jordan Stewart curled the resultant free-kick just wide of the left-hand post with City keeper Andy Coleman full length. It took the away side less than two minutes more to go in front when a superb diagonal ball from Jimmy Callacher found Niall Quinn in space down the left flank. 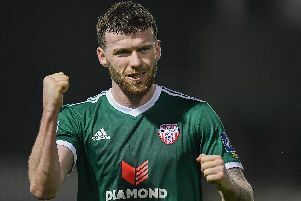 He had time to slide the ball across the six-yard box - where O’Connor was standing unmarked and the Dundalk native had the simplest of tasks to sidefoot home from close range and make it 1-0. Healy’s side were utterly dominant in the first quarter of the match and they almost doubled their advantage midway through the half when Quinn drove a low free-kick from just outside the box on the right across goal. All it needed was the most minimal of touches to poke it home, but instead the ball flew out a yard past the left-hand post. Linfield thought they had the chance to double their lead from the spot nine minutes before half-time when referee Arnold Hunter blew his whistle and indicated there had been a handball from a Newry player in the box. With no Linfield appeals and Newry players adamant the official had got it wrong, Hunter then reversed his decision and awarded a free-kick to the hosts. City went agonisingly close in the final minute of normal time in the half when Declan Carville did excellently to hold off his man and play a through ball into the path of Karl Moody. The recent signing beat Gareth Deane with his poked shot from 16 yards, only to see the ball come off the base of the right-hand post. Three minutes into the second period, City spurned a glorious opportunity to equalise when this time Hunter did award the penalty after James Walker had been fouled by half-time sub Andrew Mitchell. Montgomery took the spot-kick, but Deane guessed correctly - diving to his right to keep the penalty out and keep his side in front. Newry were made to pay for that miss as Linfield got their second of the game on 56 minutes and it was that man O’Connor again. This time Joel Cooper was the provider, again from the left flank, as his low ball was turned in by the predatory O’Connor at the near post.